Deadmonton.com breadcrumbs, speed, and Open Graph... for a zombie apocalypse? Ok, speed probably makes sense, you want to be quicker than the dead, especially if you're talking about Deadmonton.com. Breadcrumbs? Perhaps you have a vegetarian zombie following you? Open Graph? What? This is not a list of things you want during a zombie apocalypse. Instead, these are the things that have taken me away from said apocalypse. While it appears that nothing has been done on the website in over a week, I've actually put in more hours this week than most. But no one will ever know. One thing you will notice on Deadmonton.com is the new navigation (breadcrumbs) on each page, those handy little text links that leave a trail behind you. They look like this (highlighted in yellow). 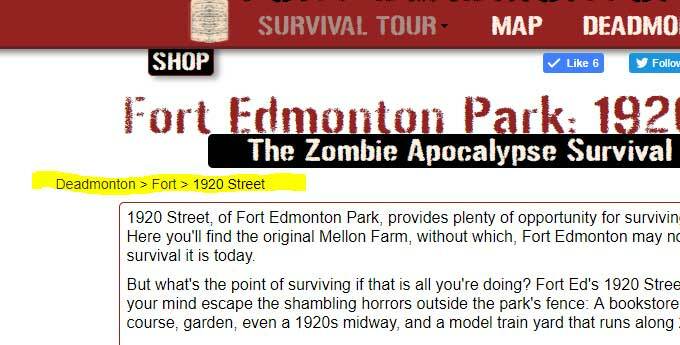 This is an image of Deadmonton.com 1920 street page (see more on the 1920 street page here) and how it relates in place to the rest of the site. It shows that it is a part of the "The Fort" section, which in turn, is part of Deadmonton. So helpful, yes, just not exciting. On top of that, are the things you don't see. I went through the design and code to help speed up the loading of the site. There is still much to do in this area--still slower than I'd like on mobile--but there is a significant improvement. That was the "speed" part of the heading above. Open graph? Well, that's just code to help search engines know just what the heck each page on Deadmonton.com is about. This work makes the site easier to enjoy... but no one really knows. It will be our secret. There, now you know I haven't just been sitting around for a week. Expect new additions to Fort Deadmonton next week. yippee yahoo! I am looking forward to it!